The University of Chicago (otherwise known as U of C or U-Chicago) is one of the most frequently searched universities in America, according to a recent internet keyword search of American colleges. U-Chicago is a private research university located in Chicago, Illinois. The school currently maintains an enrollment of more than 16,000 undergraduate and post graduate students. Notable U-Chicago alumni include countless Rhodes scholars, dozens of Nobel laureates, numerous Pulitzer Prize winners, many acclaimed scientists, and quite a few other distinguished individuals. Shown above: A statue overlooking the U-Chicago campus. Shown above: The main quad on the U-Chicago campus. 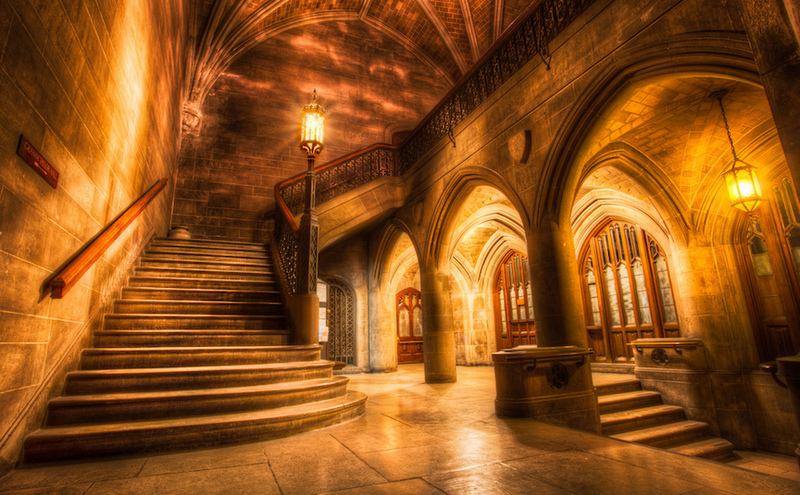 Here are the answers to some frequently asked questions about the University of Chicago. 1. Where is the University of Chicago? 2. What programs are offered at the University of Chicago? Click here for a list of PhD programs at U-Chicago. Above: The Mansueto Library Research Pavilion at U-Chicago. 3. What courses are taught at the University of Chicago Law School? 4. How much does it cost to attend the University of Chicago? Additional fees may also apply. These may include lab fees, materials fees, technology fees, and others. However, there is no application fee. Financial aid is available to U-Chicago students who complete and submit the FAFSA form. The school generously extends student grants. 5. What is the University of Chicago campus like? 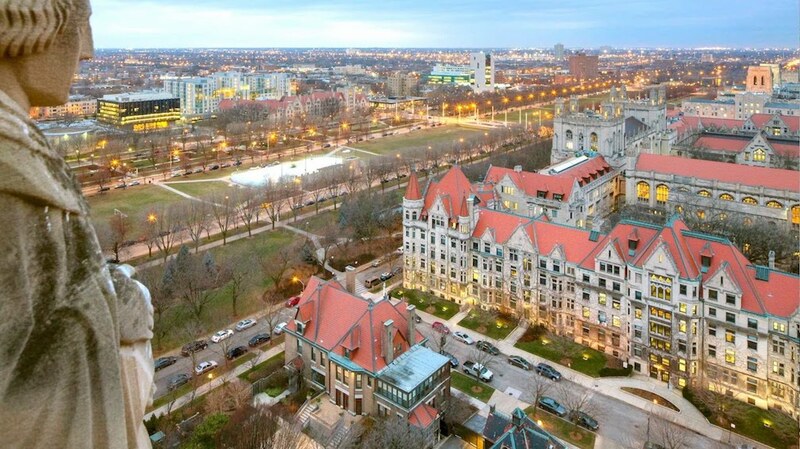 The main campus of U-Chicago spans 217 urban acres in the Hyde Park and Woodlawn neighborhoods, about 8 miles south of downtown Chicago. The campus features many impressive structures representing a mix of gothic and modern architectural styles. On-campus student housing is available. The college also offers 32 intramural sports each year. Non athletic student organizations include a variety of clubs such as an armed forces group, an LGBTQ group, a Chicago Law foundation, numerous musical groups, a film society, a student newspaper, and several business associations, to name just a few. Above: Modern student housing at U-Chicago, built in 2016. 6. 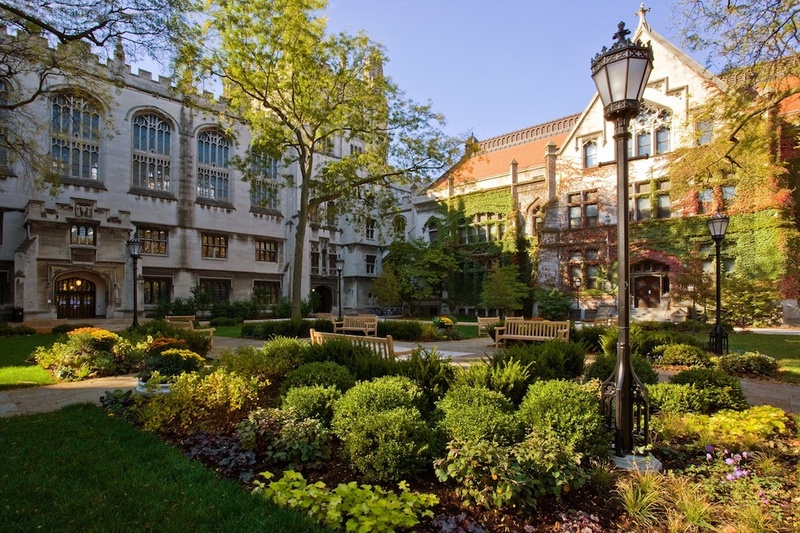 What are the distance learning options at the University of Chicago? 7. What is the contact information for University of Chicago? You can reach an operator on the U-Chicago campus by calling 773-702-1234. To contact the undergraduate admissions office, call 773-702-8650, or send a fax to 773-702-4199. To speak with someone at the graduate school, call 773-702-3760. To reach the U-Chicago Law School, call 773-702-9494. Above: The Booth School of Business at U-Chicago.